Moving with a special grace that any lightweight would envy, Muhammad Ali was probably the greatest heavyweight who ever put on the gloves, but it’s always a judgment call when you try to rate fighters from different eras. What can’t be argued is this: he was one of the great figures of the 20th century. Ali not only changed our understanding of history, he changed history. By the time he died he was known as a wise and beloved hero around the world. When he won the title in 1964 under his birth name of Cassius Clay and immediately proclaimed both his new name and loyalty to the black separatist Nation of Islam, he was considered hostile and dangerous by much of white America. Over the years he changed that perception not by compromising, but by persevering and staying true to his principles. He learned along the way, and we learned with him. He became our teacher. Ali traveled a long, tough road after reaching the summit of boxing at age 22. He suffered years of rejection from the sport he’d mastered and many more years of physical impairment from Parkinson’s disease, not to mention crushing blows from Sonny Liston and Ken Norton, hellish body shots from George Foreman, and shattering hooks from the great Joe Frazier. Ali wasn’t just a celebrity. The man could fight. 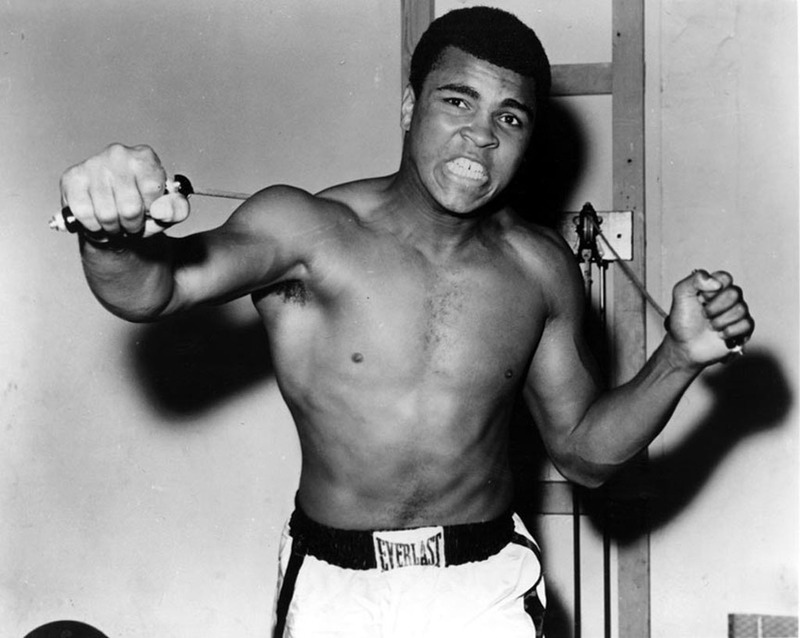 The Greatest was a force of nature who defied the rules of physics and human anatomy. Like all of us, Ali was imperfect and sometimes confused, but step by step he transformed himself into a deserving icon. There were many reasons to love him. In addition to charisma, tremendous talent, and quick wit, he had a genuine liking for people – all kinds of people, and the kindness in his spirit shined through and remained a part of him even in those last years, when his infirmity made everyday life a struggle. When Ali refused the draft in 1967 and was quickly convicted and sentenced to five years in federal prison, he didn’t get much help from his mentor Elijah Muhammad. Muhammad encouraged him to stay out of the military but didn’t tell him how he could earn a living during the three and ½ years he was appealing his sentence and banned from the sport, separated from his title not by another prizefighter but by the stroke of a pen and a press release. Stripped of his passport, he was locked inside the borders of a country that wouldn’t let him fight. Among the few sticking up for him was ABC sportscaster Howard Cosell, another man who broke boundaries. Among Ali’s enemies were plenty of other fighters, particularly Frazier, who couldn’t understand why Ali was so crudely insulting to him even after Frazier had given him financial support during Ali’s forced layoff from the sport. Frazier had a point. Back in the days of closed circuit TV, fighters signed for a specific sum. Ali had no need to build the gate but did so anyway by belittling and mocking Frazier. Liston, Foreman, and others got the same treatment, but it didn’t get under their skin the way it did Frazier’s. Young Ali, after capturing the light heavyweight Gold Medal at the 1960 Olympics, decided he liked the way wrestlers marketed themselves as personalities. As he climbed the pro heavyweight ladder he did the same, but did it better, eventually adding serious political and social commentary. This was taboo in the world of sport. The world didn’t know what to make of him. He’d been emotionally wounded growing up in Jim Crow Louisville, where African-Americans were segregated in almost every way and had limited opportunities. When he gained a forum for his opinions, he made them known. Originally classified 1Y and ineligible for immediate conscription, Ali was reclassified 1A as the Johnson Administration began running out of flesh to sacrifice to its mistakes in Vietnam. Had he served, it’s possible he’d have been steered into non-combat status giving boxing exhibitions for the troops, as Sugar Ray Robinson and Joe Louis did during World War II. Ali, however, refused to make a deal. Famously saying he had no quarrel with the Viet Cong, he did object to his country making him a second-class citizen because of the color of his skin. There were still plenty of World War II and Korean War veterans around and lots of families – including black families — that had lost loved ones in those wars and in Vietnam. Most of them failed to see things Ali’s way. Ali’s long layoff took place during what would have been his prime. Few fans got to see the best of him. In a more perfect world he’d have competed during those years and shaved years off the long end of his career when punches did more damage to his aging brain and he was less capable of avoiding them. It was a terrible irony that this man so physically gifted was brought so low by infirmities that he couldn’t eat his meals without assistance and that the Parkinson’s was undoubtedly caused by the sport he loved – a sport that didn’t always love him back. After Ali was readmitted to prizefighting and became a positive national figure, he was a prized guest on late-night talk shows. This lasted until the disease became apparent. The hosts sympathized with him, but he was bad TV, making audiences uncomfortable. Now he rests the final rest, Muhammad Ali, American original. Ivan G. Goldman’s 5th novel The Debtor Class is a ‘gripping …triumphant read,’ says Publishers Weekly. A future cult classic with ‘howlingly funny dialogue,’ says Booklist. Available from Permanent Press wherever fine books are sold. Goldman is a New York Times best-selling author.